Sarcoidosis (from sarc meaning flesh, -oid, like, and -osis, diseased or abnormal condition), also called sarcoid, Besnier-Boeck disease or Besnier-Boeck-Schaumann disease, is a disease in which abnormal collections of chronic inflammatory cells (granulomas) form as nodules in multiple organs. The cause of sarcoidosis is unknown. Granulomas most often appear in the lungs or the lymph nodes, but virtually any organ can be affected. Normally the onset is gradual. Sarcoidosis may be asymptomatic or chronic. It commonly improves or clears up spontaneously. 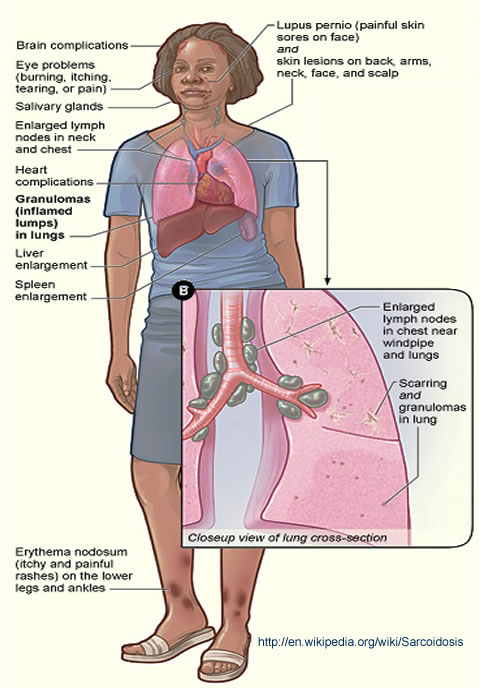 More than 2/3 of people with lung sarcoidosis have no symptoms after 9 years. About 50% have relapses. About 10% develop serious disability. Lung scarring or infection may lead to respiratory failure and death.Chronic patients may deal with waxing and waning symptoms over many years. Sarcoidosis is a systemic disease that can affect any organ. Common symptoms are vague, such as fatigue unchanged by sleep, lack of energy, weight loss, aches and pains, arthritis, dry eyes, swelling of the knees, blurry vision, shortness of breath, a dry hacking cough or skin lesions. Sarcoidosis and cancer may mimic one another, making the distinction difficult. The cutaneous symptoms vary, and range from rashes and noduli (small bumps) to erythema nodosum or lupus pernio. It is often asymptomatic. Preliminary diagnosis of sarcoidosis is based on the patient's medical history, routine tests, a physical examination, and a chest x- ray. The doctor confirms the diagnosis of sarcoidosis by eliminating other diseases with similar features.Even when there are no symptoms, a doctor can sometimes detect signs of sarcoidosis during a routine examination, usually a chest x- ray, or when checking out another complaint. The patient's age and race or ethnic group can raise an additional red flag that a sign or symptom of illness could be related to sarcoidosis. Enlargement of the salivary or tear glands and cysts in bone tissue are also among sarcoidosis signals. The lungs are usually the first site involved in sarcoidosis. Indeed, about nine out of 10 sarcoidosis patients have some type of lung problem, with nearly one-third of these patients showing some respiratory symptoms—usually coughing, either dry or with phlegm, and dyspnea. Occasionally, patients have chest pain and a feeling of tightness in the chest. Symptoms can appear suddenly and then disappear. Sometimes, however, they can continue over a lifetime. What pulmonologists do to cure sarcoidosis? Fortunately, many patients with sarcoidosis require no treatment. Symptoms, after all, are usually not disabling and do tend to disappear spontaneously.When therapy is recommended, the main goal is to keep the lungs and other affected body organs working and to relieve symptoms. The disease is considered inactive once the symptoms fade. After many years of experience with treating the disease, corticosteroid drugs remain the primary treatment for inflammation and granuloma formation. Prednisone is probably the corticosteroid most often prescribed today. There is no treatment at present to reverse the lung scarring (fibrosis) that might be present in advanced sarcoidosis. More than one test is needed to diagnose sarcoidosis. Corticosteroid treatment usually results in improvement. Symptoms often start up again, however, when it is stopped. Treatment, therefore, may be necessary for several years, sometimes for as long as the disease remains active or to prevent relapse.Frequent checkups are important so that the doctor can monitor the illness and, if necessary, adjust the treatment.